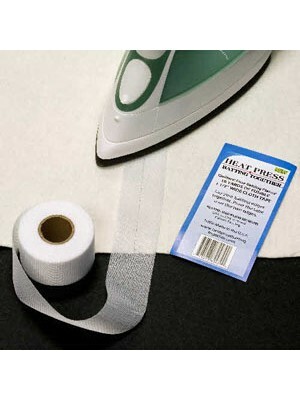 Cotton and Bamboo wadding is naturally anti bacterial. 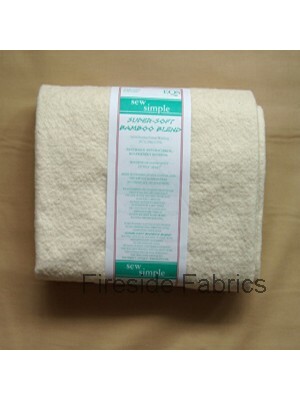 It is very soft wadding and is normally 50% bamboo and 50% cotton. It has a lighter feel to it because of the bamboo. This is a more eco friendly wadding which drapes beautifully. Heat Press by Jean Harwood Designs13.7 meters x 3.8cm If you find the batting/wadding you are using is not quite long or wide enough then use Heat..
Cot size 45 x 60 ins (114.3 x 152.4cm) NATURALLY ANTI-BACTERIAL, ECO FRIENDLY MATERIAL 50% Bamboo 50% Cotton Wadding Machine or Hand Quilt up to 8".. 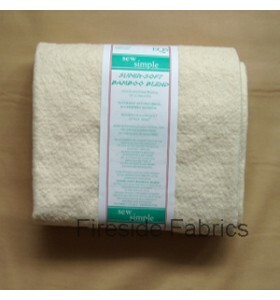 Lap size 45 x 45 ins (114.3 x 114.3cm) NATURALLY ANTI-BACTERIAL, ECO FRIENDLY MATERIAL 50% Bamboo 50% Cotton Wadding Machine or Hand Quilt up to 8"..
Queen size 108 x 90 ins (274.3 x 228.6cm) NATURALLY ANTI-BACTERIAL, ECO FRIENDLY MATERIAL 50% Bamboo 50% Cotton Wadding Machine or Hand Quilt..
Twin size 72 x 90 ins (182.9 x 228.6cm) NATURALLY ANTI-BACTERIAL, ECO FRIENDLY MATERIAL 50% Bamboo 50% Cotton Wadding Machine or Hand Quilt u..